It’s that time of year again, where we begin thinking about what hand-made presents we need to get started on if they’re going to be ready in time for Christmas. With this in mind, inside we have plenty of small but perfectly formed projects that you would be proud to give or receive. In fact, you may find it hard to part with them! With an array of quick to hook accessories, homewares and even simple garments, you should be able to cover most of your gifting needs. One present I would love to find in my stocking this year is the pair of pom-pom slippers by Amber Francesca. These comfy slippers are both practical and stylish – and I just can’t resist a cute pom-pom! Liz Ward’s gorgeously cosy poncho on this month’s cover would also make a great gift. The super bulky weight yarn makes it fly off the hook in no time at all. However, the asymmetrical silhouette and squishy roll neck are stylish and substantial enough to make the receiver suitably impressed by the amount of effort that has gone into their gift! The poncho would also be a great project to try out this issue’s free gift, a set of blocking pins. They’re great for holding pieces together as you seam as well as markers for checking tension – and they’ll also be just what you need for blocking our stunning hairpin lace shawl (right). 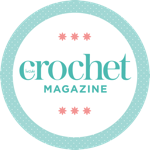 Find these fabulous patterns in issue 71, on sale 23rd October 2015!